The 'Old Windmill Tower' on Wickham Terrace is the oldest surviving European structure in Queensland and one of the heritage gems of Brisbane. It has been used for a variety of purposes since its construction by convicts in 1828, being at different times a windmill (originally driven by sails, and then by treadmill) a telegraph signal station, fire brigade observation point, radio research and television broadcasting station, and now a heritage-listed historical site. All this history was quite interesting in its own way, but there was one incident that was heads-and-shoulders more dramatic than anything else that happened there (including the time a convict slipped to his death on the treadmill). In the winter of 1841, during the dying months of the convict settlement, two Aboriginal men - Mullan and Ningavil - were hanged at the windmill tower for the murder of surveyor Granville Stapylton and his assistant William Tuck near Mt Lindesay. It was a fascinating case for various reasons: a graphic local example of early Aboriginal-European conflict over law and land; the horrifically grisly murder scene; the unusual decision to return the prisoners to Brisbane after their Sydney trial; and the fact that it appears the wrong men were convicted. All those details are covered in the book The Hanging at the Brisbane Windmill, but this article will focus specifically on the type of gallows used that day, because it is still not clear if the unfortunate men were hanged from the tower, or just near it. The commonly-believed story is that they were hanged from the windmill, but even then there are differing accounts of exactly what the gallows looked like. Was the rope attached to the windmill sails, or a pole sticking out of a window, or did the whole thing take place on a nearby separate gallows constructed from the dismantled sails themselves? Different records tell different stories and there is still uncertainty on this matter. The windmill had been constructed on a high ridge next to the convict settlement with the intention of using it to grind corn, which was the main ingredient of the convict diet. The sandstone-and-brick tower was 16 metres high and encircled by a small exterior balcony about a third of the way up the side, allowing access for the maintenance of the large wooden sails. The windmill turned out to be mechanically unreliable as it was not well positioned to catch the wind, and it also required a lot of maintenance. A convict-operated treadmill built adjacent to the mill compensated for this problem. Despite these technical issues, the windmill was reported to still be working in 1841, having been maintained by convict mechanics. Tom Dowse, who arrived in Brisbane in July 1842, recalled that, ‘We Journey’d up the hill to inspect that relict of old times - its well appointed Machenery, its revolving arms dressed with a complete suit of Sails, all in proper working order’. Dowse also reported in a March 1845 letter to the Sydney Morning Herald that the mill was still working and being used by private individuals for grinding corn and wheat. The contemporary observations of Dowse were contradicted by the journalist J.J. Knight, who wrote in 1898 that the windmill had been 'partially dismantled' by the time of the hanging. The question of the working status of the windmill in the early 1840s is important when assessing Knight's further claim that the 'disused arms made convenient timber for a staging which for the purposes of the execution projected from the balcony’. He also wrote that 'a pole was run out from a window above, and to this was fastened the fatal rope'. This is one of the clearest written descriptions of the actual gallows used for the hanging of Mullan and Ningavil, but Knight was writing over half-a-century after the event and using oral history sources, which can sometimes be quite unreliable. A nine-year-old Tom Petrie was a witness of the hanging, which was described in his reminiscences (published in 1904) as taking place 'at the windmill, which was fixed up for the occasion'. This phrasing suggests that the windmill itself was adapted for the purposes of the execution. Whatever the gallows looked like, we do know that they were constructed by Tom's father Andrew Petrie, who was the Foreman of Works in the settlement. Knight wrote that Alexander Green, the executioner, brought up from Sydney for the occasion, was impressed with the gallows and assured Petrie that they were ‘quite equal to the affair in Sydney’. 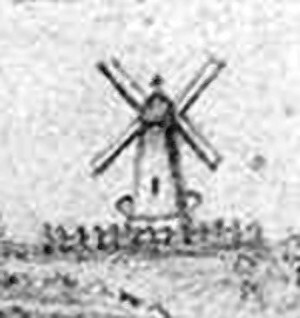 The balcony of the windmill, possibly used as the gallows stage, can be seen below in this detail from a sketch of the settlement, circa 1835 (attributed to Henry Boucher Bowerman, John Oxley Library). Unfortunately, contemporary newspaper reports of the execution provide no description of the gallows, only telling us that the hanging took place 'at' Windmill Hill. The official records are also quiet on the subject. This was only the second hanging to have taken place at Moreton Bay, the first being in 1830 when two runaway convicts were returned after trial in Sydney and executed in the yard of the convict barracks, reportedly on a scaffold made for the occasion. It is not known what happened to those gallows, but in later decades it was common practice for gallows to be dismantled and stored away after use, then reconstructed when required again. Is it possible that the components of the convict gallows were carried up Windmill Hill in 1841 to be reassembled and reused there? There is no evidence to suggest this actually did happen, but it does remain a possibility. The next Brisbane hanging came in 1850, when two murderers were hanged on Queen Street. On that occasion, second-hand gallows were transported up from Maitland Gaol, which had recently acquired a new set. A panoramic landscape by Henry W. Boucher Bowerman, depicting Brisbane circa 1835. So while the most descriptive evidence suggests that the windmill tower was adapted for use as gallows, either with the construction of a new attached scaffold or simply using the existing balcony, that evidence was provided decades later and there are no contemporary accounts to back it up. So ended the hanging of Mullan and Ningavil. They had been returned from Sydney to Brisbane so that their deaths would serve as a lesson to those who witnessed it, which turned out to be about 100-300 Aboriginal people as well the majority of the European population of the settlement. After the event, the instrument of the prisoner's death was immediately removed. The windmill itself was sold and dismantled for parts in 1849, and converted into a telegraph signal station in 1861. By that time Brisbane had a new prison (at Petrie Terrace) and executions were conducted inside the prison yards, away from the prying eyes of the public. Coincidentally, the first person to be hanged at that new prison was Thomas Woods, who - as one of the few remaining convicts in the Moreton Bay Penal Settlement in July 1841 - had been mustered to watch Mullan and Ningavil hang at the windmill. Clearly, the intended lesson of their execution had not been learned by some.